Perfecta Pump GF32-9 Submersible Pump - Ideal for pumping everything from contaminated, dirty water, corrosive liquids to light dewatering. Standard delivery is 1-2 weeks but typically will ship sooner. The GF32-9 comes equipped with a fully automatic on/off level switch as standard. 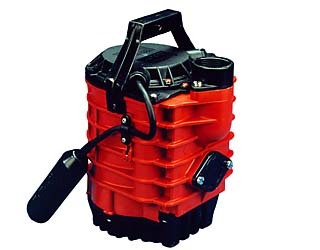 The pump is easily installed in a sump. The Perfecta® Pump for safeguarding vaults, emptying tanks or pumping out ponds. The unique dual port design virtually eliminates kinks in your hose; use vertical port for deep/narrow places or use the horizontal port for shallow/wide applications. Not for use in flammable liquids! Consult chemical resistance chart for compatibility between pump materials and liquid before operating pump. Compact and lightweight. Only 13.5 Lbs. Never rusts. Excellent resistance against acids, alkalis. Two discharge ports. 1 1/4" inside threaded connection and one 1 1/2" tapered hose connection delivered with each pump. Thermal breaker incorporated in motor windings shuts off power before over-heating occurs due to locked rotor or long periods of running dry (150°C). For permanent installation temperature should not to exceed 135°F. For intermittent use submerge less than 20 min. in 195°F maximum.